Education is the pillar of the prosperity and culture of our people’s future. The first institution where our children are consciously in contact with education is the kindergarten. 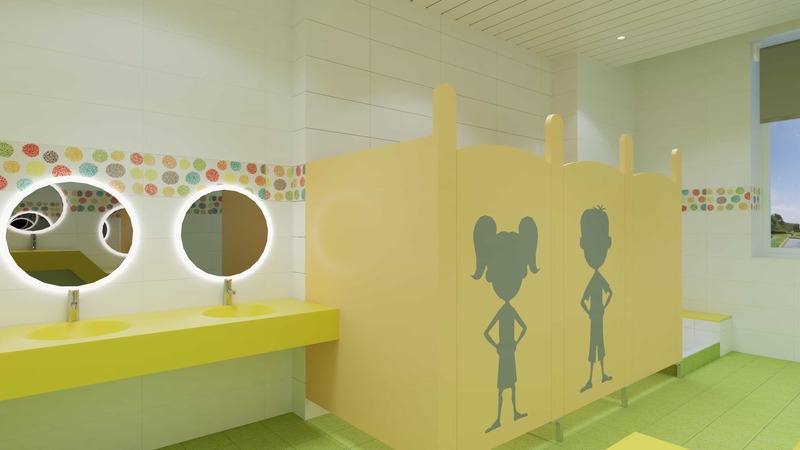 As parents, we have also encountered very different day care centers, and we have had quite different expectations for their furniture, interior design solutions, ergonomics, lighting and room solutions. Fortunately, as our interior architects, our work enables us to influence the experience that future generations of the children of Saaremaa should receive through their first educational institution. 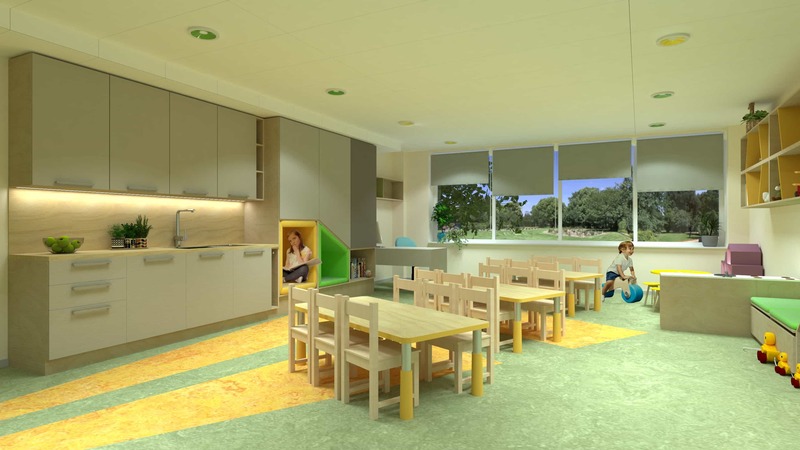 This kindergarten has rooms for six groups, workrooms, laundry facilities, a basement kitchen and a hall. There is also a swimming pool on the fourth floor to teach children swimming. Our main task was to create an architectural interior design project – to set up a selection of finishing materials, color solutions, furniture layout and selection, choice of luminaires and design of custom-made furniture for the premises. For this project, the predetermined limits were the structure of the existing building and the layout of the rooms. Collaboration with the customer was smooth. In agreement with the client, it was decided to remove the divisions in the group rooms between the game and the sleeping quarters and replace them with a sliding doors so that the daylight would send children throughout the day. We had to consider many lighting requirements, which somewhat limited the choice of luminaires, based on the special requirements imposed on the child care institution. We set the goal that the interior elements and furniture would be safe, durable and eco-friendly. However, we didn’t want to compromise on joy and colors. For example, for the flooring in group rooms we offered natural and health-friendly marmoleum that has a wide variety of colours, which brought us the motif of “wind rose”, known from metrology.. The centerpiece of the interior architecture of the kindergarten were field flowers and also the “rose of the winds” already mentioned, which defined the color gamma of the rooms. Since each group bears the names of different flowers, we decided to use the colors inspired by these flowers in the group rooms. 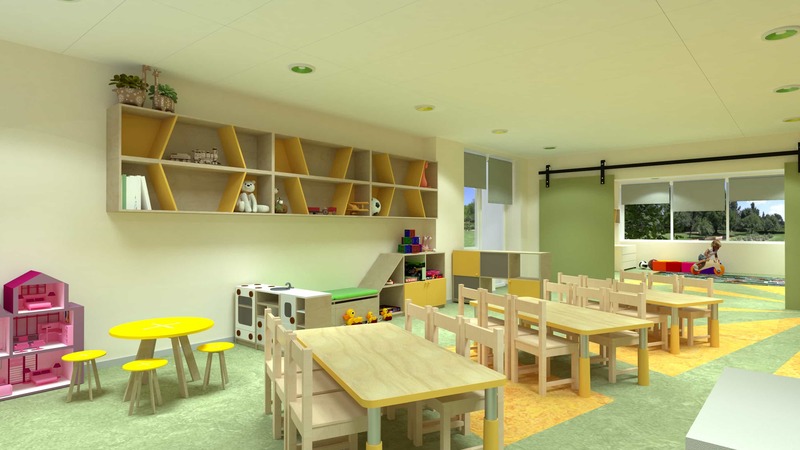 In our opinion, it is extremely important and natural that when a child arrives in a kindergarten in the morning from his modern and tasteful home, he should not suffer from a strong contrast in the room where he spends one-third of the day. So we spent quite a bit of time designing custom furniture to create a special and joyful interior. In terms of materials, the customer also wanted to have birch veneered furniture, as they wanted to reuse boards and chairs from the existing furniture. When choosing furniture, we tried to choose products from Estonian furniture manufacturers. Thus, when making plans and visuals, we chose one of the Pärnu furniture manufacturers, 123OK, who manufactures children’s furniture made from high quality birch veneer. An important feature of this kindergarten is that the food is prepared in the basement kitchen. Each group has its own kitchen corner, where the food is put out, and where the dishes are taken back later. Also, each group has its own tiny padded reading or play area where children can calmly relax and play. Teachers take care that our children learn numbers and letters and can be social. It’s all a lot more fun to do in a bright and tasteful developing environment, which you would like to come back to every day in the morning for some unexplainable reason. Our adult children often recall the times of their kindergarten. We believe and hope that Palazzo’s interior architects, who put a piece of their heart end soul into this project, will help create the children of Saaremaa more wonderful memories of their childhood.